Sweating sickness, or the English Sweat, was a horrible disease which decimated towns and took thousands of lives in its five epidemics in England in 1485, 1508, 1517, 1528 and 1551. It was a disease which killed quickly. Chronicler Edward Hall wrote of how it could kill within 2-3 hours, commenting “some merry at dinner and dedde at supper”. In the last outbreak, in summer, 1551, it claimed the lives of fifteen year-old Henry Brandon, 2nd Duke of Suffolk, and his fourteen year-old brother, Charles, 3rd Duke of Suffolk. These boys were the sons of the late Charles Brandon, 1st Duke of Suffolk, and his fourth wife Catherine Willoughby, Baroness Willoughby de Eresby and Duchess of Suffolk. They had been studying at St John’s College, Cambridge, when sweating sickness broke out in the town and so their mother, who had been staying in Kingston, a village just outside Cambridge, had the boys moved to the home of the Bishop of Lincoln in Buckden, Huntingdonshire. While the boys were being moved to Buckden, the Duchess became ill. By the time she had recovered enough to travel to Buckden, Henry Brandon had died and Charles, who had succeeded his brother as Duke of Suffolk, was dying. 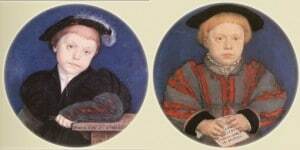 Both boys died on the same day, 14th July 1551, and the Duchess must have been heartbroken. I have also written a book on the disease, Sweating Sickness: In a Nutshell – click here for more information. Read, Evelyn (1963) My Lady Suffolk, p83-84. Strype, John Ecclesiastical Memorials Relating Chiefly to Religion, and the Reformation of It, and the Emergencies of the Church of England, Under King Henry VIII, King Edward VI, and Queen Mary I, Volume II, p496. How tragic! I can recommend the sweating sickness book. It is very informative and easy to read. So interesting, First time that I heard of it. Enjoy ed the video and the old English. Although parents no doubt mourned for their children, it was different from today when such early deaths happen very seldom and therefore come as a shock to parents. At that time parents had lost some of their siblings as children and knew that it was almost certain that they would lose at least some of their own children, sometimes many or even all. It was typical to the age that Elizabeth of York comforted Henry VII after they lost Arthur that they were young enough to have more children. Or that a child could get the same Christian name than his or her late sibling. While you’re right in broad terms about attitudes to deaths of children being different in the early modern era compared to today, I’d imagine that the deaths of both children – who were in their early teens at the time, so had survived the most perilous period of childhood in terms of risk of mortality – on the same day would indeed have qualified as a massive shock and sorrow to their mother in much the same way as it would do today. Poor little mites you can see their brothers, the likeness between them is quite strong, the infant mortality rate was high and both rich and poor suffered, what a nasty disease it was and quite mysterious the way it suddenly came and went. Always well up when I read those words, so moving are they and real, of course. There was a lady lived in my home town and she lost all three sons in the Second World War, and so many young people are dying before their parents these days due to cancer. Poor Katherine Brandon, the loss of her sons within hours was devastating. The deaths of these two promising young men in their teens was very sad. Their mother was with them, but their deaths must have been terribly heartbreaking. Even though Katherine was remarkably strong, she never really got over this loss, and there is a lot of evidence that despite the fact death was just around the corner and many children died that those children were mourned and remembered. Poems and writing commemorated the death of children and the sadness felt by their parents. It was as common to mourn children then as now. Katherine may even have experienced guilt, wandering if her own life and deeds had caused their deaths, under divine intervention, this was also a common belief at this time. Even in our age which has lost its sense of the divine we ask why, we examine our lives and relationships. Times may change, people don’t. It was also quite common to name their future children after the deceased one and yes in those days the parents did often wonder if they had done anything to incur the Almighty, I think King Henry genuinely believed his sons died because he had married Arthur’s widow, it was a superstitious age and plagues and thunderstorms and eclipses of the sun to were seen as a sign of having incurred Gods wrath, in those days you were extremely lucky to survive into your thirties twenties even, when you consider disease, poor hygiene wars and that was the lower classes, but even the wealthy although they could afford to live in more luxurious surroundings and eat better food and afford doctors, the doctors themselves wernt much help having zero knowledge of the human body and all they did was apply leeches and make up potions, and then of course there was the incredibly dangerous sport of jousting which incapitated many a healthy young man including the King, the only good thing about that disease is that it killed swiftly so at least the victims didn’t suffer for long, hope not anyway, whearas the Bubonic plague, commonly known as The Black Death caused horrendous suffering there were two strains of that, and one strain attacked the lungs if you had that strain you didn’t survive, but both strains caused the most awful suffering, one doctor on the tv said they were in a lot of pain with violent headaches and nausea, then the boils that appeared, whole families were wiped out, that didn’t appear in the Tudor reign but about hundred years earlier then it reappeared in 1665 in England having travelled from the continent, we are lucky now we live in this age were there are vaccines and the right medicines to treat these awful diseases. Henry evidently believed in his own explanation as he always was very good to believe that what he wanted was right. But the crux of the matter is why did he believed so, when many other men (including the French king Louis XII) did not have sons or even children? In Divorced, Beheaded, Survived Karen Lindsey loans Lawrence Stone’s Crisis of the Aristocracy that among the nobility of Henry’s generation, 19 percent of the first marriages were barren and 29 percent had no living sons. In second marriages fertility was even lower: 48 percent barren, 50 percent sonless. As Lindsey says, evidently not all those men had invoked God’s wrath by marrying their brother’s widow. It was Henry’s character and religiosity that was different. Where Katherine understood that misfortunes could happen to people regardless of they “deserved” them or not and accepted that as God’s will that was mysterious to men, Henry thought that what he wanted, God must give him. I think Henry was always aware that the Tudor Dynasty had usurped the throne and that was one of the reasons he was anxious to get on Gods right side, he was very religious in a religious age and superstitious to, although he was tired of Katherine and out of love with her had they a couple of healthy sons I doubt he would have chose to get rid of her, I believe he genuinely believed his marriage was cursed because of what it said in Leviticus about marrying his brothers widow, just as years later he believed Anne had bewitched him into marrying her and making her Queen, I don’t think he was just saying these things just to get rid of his wives, I do think he actually believed that, he believed God spoke direct to him as Gods anointed on earth, just as in ancient Egypt the Pharaohs believed they were descended from their Gods, compared to the Plantagenets the Tudor dynasty was short lived, it was a bloody dynasty but brilliant, and like most brilliant things it did not endure. I did not claim that Henry did not believe what he said. Probably he did as he always believed that what he wanted was right and that God *had* to give it to him. As for Leviticus, it spoke of a brother’s wife, not a brother’s widow, so it actually forbid *stealing* her from a living brother. Also Henry and Katherine were not without children, they had Mary (and Henry who had died as a baby). Elsewhere in the Old Testament there is a command to marry a brother’s wife if they had had no child. Regarding Henry’s belief that Anne had “bewitched” him to marry her – even today there are people who say “you made me hit you with your nagging” because they are not capable to take responsibility for their own actions. Henry would never admit that he had been wrong or done an error, so the fault had to be someone else’s. He had no son by Katherine of Aragon, so the marriage had to be invalid and he got it nullified regardless of consequences, instead of accepting that other men and kings had no son and marry her daughter off. He had no son by Anne Boleyn, so she had to be a witch and an adulteress, and he killed her instead of accepting his result of his own decision or annulling the marriage. Anne of Cleves did not instantly fell in love with a stranger who started to kiss her, so she have to be so repulsive that he could not made love to her, and he publicly humiliated her in the annulment process by claiming that she was no virgin, instead of accepting that royal marriage were not based on love and made best of it or handled the annulment decently. Catherine Howard made him look a fool because he regarded her a virgin and an ideal wife, so she had to die for it, so he killed her instead of understanding that he had made a mistake to take so young a wife and simply annulling the marriage on the basis of pre-contract. But Henry was very superstitious and although we know he was a hypocrite and changed the law to suit himself when he wanted to marry Anne and then discard her and to rid himself of Anne Of Cleve’s I don’t think the issue with his fifth wife was that she was not attracted to him at their first meeting, he was so conceited and like many men he thought he was a love god so he probably didn’t notice her apathy towards him, (if she showed any) he just didn’t find her attractive so he sought to have the marriage annulled as quick as possible, besides which although he did have a child Mary all his other sons had died and that was reason for him to think his marriage was cursed, having a daughter was tantamount in Henrys eyes to being childless, several centuries on Queen Anne Stuart believed the reason all her children died and her sister Queen Mary was barren was because they had betrayed their father James 11 and supported William Of Orange, we can’t understand superstitions like that in our time but we have to try to put ourselves in their mind and the century they lived in. The nobility had less day to day contact with their children, and once old enough for schooling, far less, as children were often sent to other households for their education. Nonetheless, the Duchess must have been devastated by the loss of both her sons in this way. Ill herself, it was truly dreadful. The boys had passed through the worst period of infant mortality and survived into their teens. She had no other living children, was a widow, an orphan, really alone in the world. She was also a survivor-she married again, it seems for love, and had more children, this time, two survived her. She completely rebuilt her life. You can be aware that something is possible, even likely, but when it actually happens, it is still devastating. The only insulation for a parent is perhaps that lack of really close ties engendered by the system. Children were still seen as a means of advancing family interests, and often used quite ruthlessly for that purpose. Even in such a family, the loss of both heirs would be devastating. For Catherine, one suspects it was the simple loss of her boys. She married a man far beneath her status as Duchess, something she would have avoided had she been ambitious. As a Baroness in her own right, she was quite a catch. I believe her world was destroyed when her sons died, but she found consolation, love, and made a new life for herself. One of the few happy endings we know of for women of the time.